Germany (FIH World Ranking: 6) had trailed on three occasions before fighting back to force the shoot-out, with Moritz Rothländer’s superb backhand strike into the top left corner levelling the scores at 4-4 and denying Spain’s Red Sticks (WR:9) their first victory in regular time. However, another excellent shoot-out display from the Spaniards, and goalkeeper Quico Cortes in particular, saw the home favourites take two points from the contest to move up to sixth in the FIH Pro League standings, with Germany dropping out of the top four into fifth position. The top four finishers in the FIH Pro League will secure berths in both the Olympic qualification events and also the showpiece FIH Pro League Grand Final, which takes place in June at Amstelveen’s Wagener Stadium in the Netherlands. Spain made an excellent start to their clash against higher-ranked Germany, forcing Die Honamas goalkeeper Victor Aly into some early saves before taking a deserved lead just six minutes into the contest. Alvaro Iglesias was the scorer, getting a crucial touch onto Sergi Enrique’s long pass into the circle to give Aly little chance of saving. Germany - who had made six changes from the team that defeated the Netherlands in Rotterdam last week - found their rhythm as the period progressed and dragged themselves level just before the end of the first quarter thanks to a fierce penalty corner drag-flick from Lukas Windfeder, who sent an unstoppable effort inside the right post after Mats Grambusch had been fouled inside the Spanish circle. It was Mats Grambusch who put Germany ahead for the first time early in the third quarter, catching Spain goalkeeper Cortes off guard with a fine strike from the top of the circle. It was a lead that lasted less than a minute, with Vincenc Ruiz finding space to volley past Aly to level the scores at 2-2, much to the delight of the watching home fans the Estadio Betero. A breathless final quarter saw the Spaniards twice edge ahead in the contest only for Germany to peg their opponents back. Xavi Lleonart’s close range strike make it 3-2 before Germany captain Martin Häner restored parity from the penalty spot after Lleonart had fouled Dieter Linnekogel, with Spain’s Pau Quemada tapping in just before Rothländer scored his sensational backhand strike and force the shoot-out. Fine saves from Cortes and Aly, denying Germany’s Thies Prinz and Spain’s Sergi Enrique respectively, left the shoot-out evenly balanced at 3-3 ahead of the fifth and final round of one-on-ones. When Cortes produced a brilliant diving block to stop Mats Grambusch, Spain’s Josep Romeu simply needed to find the net to give his side the bonus point. However, it was never going to be that straight-forward. Romeu thought he had won the contest when he found the net only for a video referral to spot an infringement, meaning that Romeu would have to do it all over again. The second effort forced an error from Aly, with a penalty stroke being awarded after the German shot-stopper was adjudged to have fouled his Spanish opponent. Lleonart stepped up to take the stoke and made no mistake, slamming emphatically into the top right corner to give Spain yet another bonus point. Jeremy Hayward fired in two trademark drag flicks from penalty corners in the 11th and 15th minutes. Last year’s World Cup top scorer Blake Govers scored his maiden goal of the FIH Pro League with a 30th minute rocket from a short corner. KUALA LUMPUR: Youngster Muhd Arif Syafie Ishak has been having the time of his life after being called up to the national hockey team for the first time. Just a week into the squad, the Pekan-born Arif has been given a chance to train under legendary Dutch penalty corner drag flicker Taeke Taekema in Kuantan. And Arif is just loving it as he is picking up valuable tips from Takema, regarded as one of the world’s top drag flickers. Taekema represented Holland for 11 years from 2000 and has scored a total of 221 goals in 242 matches. The Malaysian Hockey Confederation (MHC) invited Taekema to Malaysia for a week following a request from national coach Roelant Oltmans in a bid to help improve Malaysian players’ penalty corner conversion rate in tournaments. Arif, who impressed the national selectors after converting six penalty corners for Tenaga in the recent Malaysia Hockey League (MHL), said it was a dream come true to learn from a legend like Taekema. “Taekema was the top drag flicker during his time and I’m impressed with his prowess in goal scoring,” said Arif. “Many goalkeepers used to fear him as he had such accuracy in penalty corners. “I’m lucky to get valuable tips from Taekema on how to improve my drag flicks. He also taught me how to build up my confidence in taking penalty corners. If Arif continues to impress, he may even get a chance to represent Malaysia in the Sultan Azlan Shah Cup in Ipoh next week as two defenders – captain Muhd Sukri Abdul Mutalib and Syed Mohamad Syafiq Syed Cholan – are injured. “All I can do is to just keep my fingers crossed,” said Arif, who was a member of the Malaysian team that won their first-ever Youth Olympic gold medal in Buenos Aires last October. Apart from Malaysia, five other teams - India, Japan, South Korea, Canada and Poland – will feature in the Sultan Azlan Shah Cup. COLORADO SPRINGS, Colo. – In preparation for the upcoming FIH Hockey Series Final in Bhubaneswar, India this June, the U.S. Men’s National Team has announced a four-game test series against FIH World Ranked No. 17 Korea, taking place April 18 to 22 at the Korea National Training Center in Seoul, South Korea. The series comes after USA competed in the 3 Nations Tournament Benalmadena, Spain from January 28 to February 3. In addition to the four matches in Seoul, USA will continue their preparation with daily training, strength training and video analysis. Wiese is expected to add additional athletes to the traveling roster pending performance at training camps. For more information regarding the U.S. Men's National Team vs. South Korea test series including the schedule, results, rosters and more, check out the official event page by clicking here. SANTIAGO, Chile – March 15, 2019 – Played at the Club Manquehue in Santiago, Chile, the U.S. U-16 and U-20 Men’s National Teams hit the turf ready to make a statement in their third match-ups. The U-16 team looked to continue their progress on closing the scoring gap against their host counterparts. Determination cut the score line in the third period, but Chile’s continued pressure and penalty corner conversions put the game out of reach as the match finished 4-1 in favor of Chile. The U-20 side saw another close match that finished in a nerve-racking battle. USA scored what would become the winning goal in the third quarter after Chile tallied one back as the game ended in favor of USA 2-1. This victory secured the series for the Junior USMNT and marks the first clinch since 2011. Game three was a physical match with Chile breaking quickly while attacking and defending with numbers. This strategy earned three penalty corners in under five minutes for the host team. Although their first two chances went awry, Chile converted on the third attempt off a rebound to take the 1-0 lead. The red, white and blue kicked up the intensity for the remainder of the frame, and even though all their forwards put on a high press, USA could not score. USA faltered in their defense in the second period, only to give away three penalty corners and an easy goal at the 25th minute mark to make it 2-0. When Danish Singh (Phoenix, Ariz.) took possession from a pass by Mehtab Grewal (Somis, Calif.) a mere 20 yards out, a goal seemed almost certain. Unfortunately, the shot went inches wide leaving the score 2-0 at halftime. USA came in to the third period determined to score. Namit Mangat (Glendale, Ariz.) sent a long pass from midfield into the circle. With a slight redirect from Singh, USA cut Chile’s lead to 2-1. Chile continued to apply pressure and was able to convert on a penalty corner in the last minute of the frame adding one back to make it 3-1. Chile added their final goal on a penalty corner conversion from an unfortunate bounce off the USA goalkeeper’s pads in the fourth quarter. The final score finished 4-1 to Chile. The U.S. U-20 Men’s National Team recorded its second victory in this four-game series with Chile in a nerve wrecking 2-1 battle. In this tight match, Chile opened with two quick attempts on goal. Subsequent penalty corner chances by the USA in the 4th minute and Chile in the 11th minute were both denied. USA edged to an early lead by capitalizing on a series of good connections initiated by Jatin Sharma (South San Francisco, Calif.) to quickly move the ball upfield after defending a Chile penalty corner. With an assist from Colin Hennessy (Marlborough, Mass. ), Alex Curtis (London, United Kingdom) slid his shot around the on-rushing Chile goalkeeper to open the scoring 1-0. The second quarter was an even contest, with both teams sharing possession and earning chances to score. Score remained 1-0 at the end of the half. Feeling pressure to post a win, Chile was looking to capitalize on any USA errors. Frustration for the host increased after earning two penalty corners but no avail. When Alberto Montilla (Allen, Texas) stepped up to score what would become the winning goal in the third quarter, Chile redoubled their efforts. In the final minute of the period, Chile manufactured a penalty corner goal to bring the score to 2-1. As the temperature began to climb, the impact of the heat and exertion was beginning to take its toll on both squads. In the fourth quarter, USA continued to try to force the ball into areas where they could generate turnovers and capitalize on quick counters. Both teams had the chance to win the match in an even contest, but ultimately USA downed Chile 2-1. The U.S. U-16 and U-20 Men's National Teams will have their fourth and final game of the series today, Friday, March 15 at 5:00 p.m. and 6:30 p.m. ET. 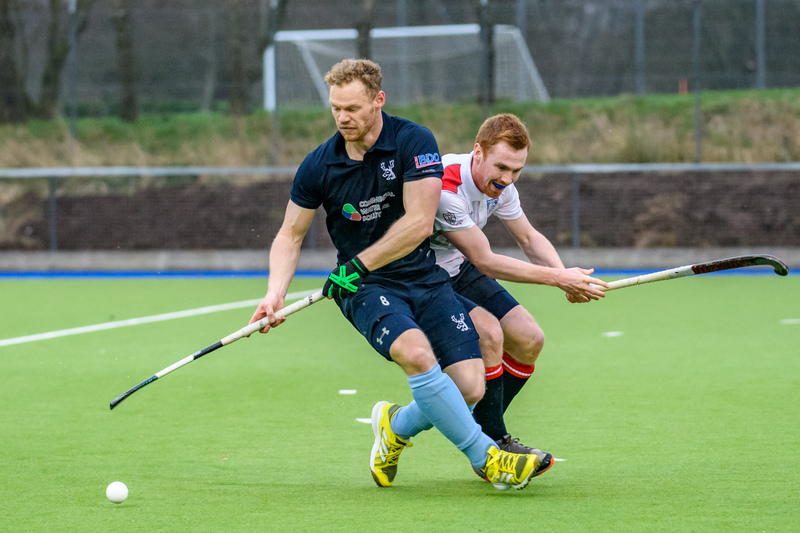 In the men’s EYHL, there’s little doubt about the top tie as Banbridge aim to stop their recent slump and get their title ambitions back on track against the Glens at St Andrew’s. “Another difficult game for us especially due to our recent run of results,” said Bann coach Mark Tumilty after they bowed out of the Irish Senior Cup and lost to Monkstown in the league last week. “We need to be more clinical in both circles in order to get our season going again. We need to produce an improved performance and I have belief in the players that we can get back to winning ways. Glenanne, meanwhile, are also coming off the back of a defeat – their first of the season outside of the Neville Cup – to Three Rock but remain two points clear and the team to catch. Lisnagarvey will look to get their challenge back on track after a 2-2 draw against YMCA when they host bottom side Cork C of I in a fixture they won 10-0 last term. Monkstown and YM go into their Dublin derby with both sides on a high from recent results. Guy Sarratt’s brilliant drag-flicks and Ryan Spencer’s classy control and reverse in the 4-3 win over Bann show plenty of rising talent in the Town ranks. For the Y, they have earned seven points from the last 12 available with Ben Campbell driving things on to give them a great shot at avoiding relegation problems. Three Rock host Annadale at Grange Road in their fourth successive home tie in the EYHL in a decent run of form. In the past fortnight, they have beaten three of the top four from the EYHL, adding a 3-1 midweek win over Pembroke in the Mills Cup. Simon Thornton excelled for Pembroke in a scoreless first half but he could not keep out Conor Empey’s effort in a goalmouth scramble after a volley of shots. Ben Walker swept in the second and when Pembroke went to 10 outfielders, Kevin Mullins added a third. Jack Ryan got one back on the final whistle. It sets up a rematch for Rovers with Glenanne on Sunday eight days on from their cracking league meeting at Grange Road as St Patrick’s Day brings the Mills Cup final. While Rovers won their meeting a week ago, the Glens had plenty of moments and but for a brilliant performance from Jamie Carr, it might have been different. Also on the Sunday are the Neville Davin Cup final between Railway Union and Portrane and the Benny Atkinson Under-16 Cup final which features the Three Rock and Monkstown young guns. On Saturday, there are also three Leinster Division One matches on the schedule. Railway Union moved top in midweek with a 5-1 win over Dublin North with Rob Devlin, Richard Forrest, Daragh Curley, Jeremy McKeever and Adam O’Callaghan sharing the goals. UCD, though, can move back above them if they win their game in hand at Newpark. The students have been training at Avoca’s home ground since work started on the Belfield venue and so it will not be wholly unfamiliar. Nonetheless, it may be a tricky tie against a Blackrock side that has found some form recently. UCD have been a bit hit and miss since Christmas but they did fire against Bandon in EYHL2 last week. Corinthian keep plugging away in third and will look to keep rolling against a Kilkenny side who will need to bounce back from a tough day against Avoca last time out. Clontarf face Dublin University in the battle for fourth spot. In total, Sunday sees four female Leinster finals up for deicision with Railway contesting three of them – four including their men in the Neville Davin Cup final – with the highlight the Jacqui Potter Cup decider against Old Alex. Railway won in 2011, 2013, 2014, 2017 and 2018, showing their penchant for the competition. Alex, meanwhile, last won the title in 2010 and will be underdogs after two league defeats to the Park Avenue side during the EYHL campaign. The cup, though, usually sees panels forced to go without their central international players and so Sarah Hawkshaw may have to sit this one out. Earlier in the day, Railway II take on Loreto II in the Jacqui Potter Shield and the Sandymount club’s Under-16s are in the Junior Jacqui Potter Plate. Muckross are going for three in-a-row in the Junior Cup when they meet Pembroke. On Saturday, the current top five meet the bottom five in the women’s EY Hockey League as leaders with plenty of intrigue over each of the major issues. Shirley McCay is a doubt for Pegasus’ Irish Hockey League trip to Old Alex on Saturday The 31-year-old Ulster talent coach had 11 stitches inserted in a nasty head wound sustained when she was accidentally struck by a ball during last week’s win over Ards and is undergoing concussion protocols. She missed Saturday’s 3-2 win over Loreto which saw Pegasus leapfrog the Dubliners to go top of the table. Pegasus captain Michelle Harvey said: “It was a solid team performance. Even though we went 1-0 down early on our heads didn’t drop and we responded with a goal shortly after. We played with discipline and desire and the whole squad played well right until the final whistle. The Belfast side will face an Old Alex side for whom Lisa Jacob has returned in recent weeks to make an impact and they can be reasonably content with their debut season in the EYHL with 16 points on the board. Loreto, now in the chasers’ role, face a tough trip to Belfast Harlequins as they look to bounce back from that defeat to Pegasus. Niamh Small has missed the last couple of weeks for the Beaufort side but Nicci Daly has been in typically elusive form to cause problems. Railway Union need to get their playoff push back on track when they face UCD in a derby encounter with Niamh and Michelle Carey and Nina Heisterkamp facing their former club, as will Holly Jenkinson, Hannah de Burgh Whyte and Kate Lloyd. Cork Harlequins and Pembroke are in the dice for fourth place and will hope for no slip-ups against the bottom two. Quins have won three of their last four games to move into fourth with Emily O’Leary, Michelle and Rebecca Barry combining brilliantly with Emma Barber becoming a strong leader. They were caused plenty of problems in the first half of the season at home against Muckross, particularly on the counter, and so they will take nothing for granted in Donnybrook. Likewise, Pembroke host Ards at Serpentine Avenue after a 4-3 battle in November. Sinead Loughran, Orla Macken and Gillian Pinder give them real dynamism in midfield. In EYHL2, Queen’s and Trinity are on the brink of the semi-final spots from Pool 1. Clodagh Fullston scored twice for Trinity either side of Sophie Maleady’s effort to record a 2-1 result in midweek against Corinthian, strengthening their hold on second place. If they win at UCC, Trinity will move to the brink of the last four while Queen’s will do likewise if they win their home tie against Corinthian. At Rosbrien, Catholic Institute host Monkstown in a high-quality meeting between two sides who have already assured themselves an extended season. The battle between World Cup silver medalists Roisin Upton and Chloe Watkins should bring out the Limerick crowd alone. Lurgan versus Dungannon is a dead rubber. The end game for National League 1 is fast approaching…Grange could seal the men`s National League 1 championship if they can see off Clydesdale at Fettes and Western Wildcats fail to take full points from their confrontation at Kelburne. 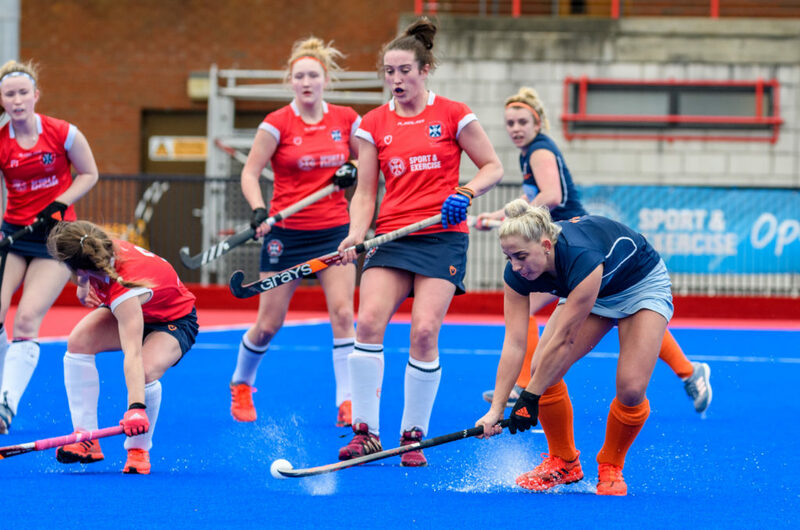 In the women`s league Edinburgh University are closing in on the finishing line, but are not there yet and this weekend have a crucial home game against second-placed Dundee Wanderers at Peffermill. There can be little doubt that Grange have the most impressive record in the league – twelve victories, three draws and no reversals is pretty consistent. While there can be some rogue results at the business end of the competition, David Knipe`s charges will be fully focussed on overcoming an increasingly unpredictable Clydesdale who have lost their last two outings. Western Wildcats are hanging in there by their claw tips, they are six points adrift and must beat Kelburne at Glasgow Green to retain any hope of catching Grange. Grove Menzieshill may now not get the chance to overtake Grange but are certain to finish in at least third spot. The Taysiders are at home to Watsonians, a side they beat 4-2 in Edinburgh near the start of the season, so will hope to continue their unbeaten run since the winter shutdown. However, what is still up for grabs is the crucial fourth spot in the table and a place in the end of season European play-offs. Here it is tight, Uddingston have just leapfrogged Hillhead on goal difference, and the two sides meet at Bothwell Castle Policies on Saturday. The Glasgow side won the initial encounter in September by 3-2, Andrew Black, Callum Duke and Adam Carmichael with the winner were on target. Brad Hughes got both Uddingston`s goals and the Aussie is one of the most prolific strikers in the division. In addition, the Lanarkshire side showed their potential last weekend with the 4-0 demolition of Clydesdale. In contrast, Hillhead have been on the back foot in their last two games against Grove Menzieshill and Western Wildcats, but they will be aiming to take fourth spot back this weekend. This one could be the game of the weekend. The chasing pack here are Clydesdale and Edinburgh University, both two points further behind. The former are against Grange, but the students could keep up the pressure with a home win against bottom side Gordonians, a side they have already beaten twice in the league and cup. There can be no doubting the game of the day in women`s National League 1, the clash between leaders Edinburgh University and second-placed Dundee Wanderers at Peffermill. It is a simple equation, an Edinburgh victory would put the champions almost out of sight of the chasing pack, but a Tayside triumph could put it all back into the melting pot. Wanderers` rise to the runners-up spot has been based recently on a run of four straight victories since the restart, and that included at 2-1 win over Wildcats. The Dundonians are currently three points behind the students at the top. In the last four outings Wanderers have packed in twenty goals with Vikki Bunce, Emily Dark, Charlotte Watson, Heather Elder and Sophie Free the main contributors. The earlier encounter in the league does not really provide much of an indicator of form – it finished a goalless draw. Edinburgh`s form has been interesting, they started the second half of the season with a 3-2 defeat at the hands of Western Wildcats, then last weekend did the league and cup double over rivals Clydesdale Western. At the moment both Western Wildcats and Western are five points adrift, although the latter have a game in hand, so they certainly must not falter against GHK and Grange respectively. Although Watsonians and Grove Menzieshill are both out of contention for a top four spot, they clash head to head on Tayside for the honour of finishing fifth. Not an easy one to predict, the Edinburgh side have a two point advantage, and the confrontation earlier in the season ended in a 1-1 draw, Lucy Lanigan`s opener for Watsonians was cancelled out by a penalty corner conversion from Katie Robertson. Butali Sugar Warriors will unleash marquee signing Amos Barkibir when they launch their Kenyan men’s hockey Premier League title defence against Sailors on Sunday at City Park Stadium. The Euro Hockey League is delighted to join forces with Scorrd to present the first Fantasy League based on the world’s best club hockey competition. For the duration of the EHL KO16/FINAL4 in Eindhoven – which runs from April 17 to 22 at HC Oranje-Rood – hockey fans around the world can be part of the action, hoping to manage their dream team to glory. It follows the hugely popular debut of the Scorrd Fantasy League at the men’s FIH World Cup late in 2018 when over 5,000 teams were created by hockey fans, across 650 mini leagues. “We have seen the fun and excitement generated by the Scorrd Fantasy League already and we reckon this will add an extra level of interest for fans in the EHL, the world’s best club hockey competition,” EHL chairman Hans-Erik Tuijt said of the link-up. 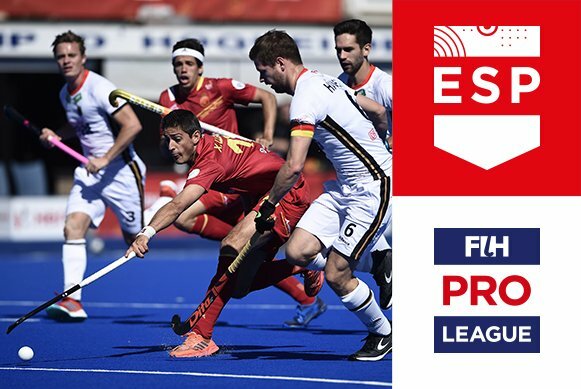 Oriol Peremiquel – a regular player in the EHL – is one of the masterminds behind the Scorrd Fantasy League and he is delighted to see the competition grow. The Fantasy League will follow the popular format with fans picking a virtual team who will earn points based on their performances and statistics in each of their EHL games at Easter. Managers pick, drop, trade and sell their players to find the winning formula. Scorrd will provide daily tips, match MVPs and stats to help you along the way. To pre-register to take part for the first EHL Fantasy League, click here. All pre-registrations will go into a draw to win EHL tickets! Lausanne, Switzerland: On the occasion of the FIH Congress in New Delhi in November 2018, IOC President Thomas Bach was one of the recipients of the FIH President’s Award. However, at that time the IOC President could not make the journey to India due to other commitments.He therefore took the opportunity of the first meeting of the year of the FIH Executive Board today in Lausanne to come to the FIH headquarters where the Award was officially presented to him. “We at FIH fully support the strategic roadmap for the Olympic movement – Agenda 2020 - to strengthen sports in society and make the Olympic Games more sustainable. In fact, our Hockey Revolution links very well with the Agenda 2020. We are also very honoured that the IOC has chosen Women’s hockey as one of the four sports it will focus on ahead of Tokyo 2020 to – hopefully – have unified Korean teams participating in the Olympic Games. 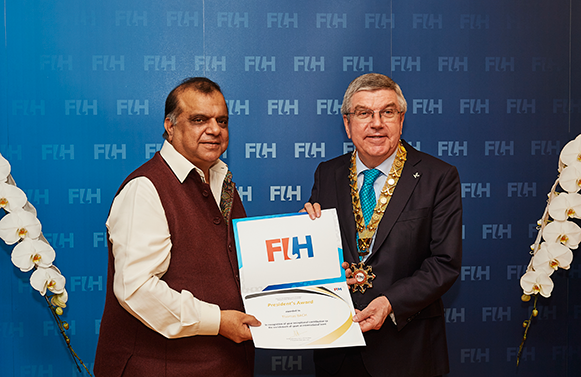 This objective is very dear to our heart as well, because we believe that hockey can contribute to making the world a better place”, said FIH President Dr. Narinder Dhruv Batra.